On April 7, U.S. Africa Command (AFRICOM) partially evacuated its military forces from Tripoli due do the deteriorating security situation in Libya. The AFRICOM personnel, tasked with supporting the U.S…. On April 7, U.S. Africa Command (AFRICOM) partially evacuated its military forces from Tripoli due do the deteriorating security situation in Libya. The AFRICOM personnel, tasked with supporting the U.S. diplomatic mission and counterterrorism efforts, was extracted by a U.S. Navy Landing Craft Air Cushion (LCAC) hovercraft from the beach of Janzour (15 km west of Tripoli). The LCAC dispatched from one of the U.S. Navy assets operating in AFRICOM’s area of responsibility – likely the San Antonio-class USS Arlington amphibious transport dock, which was last reported near Carthage on March 24. The evacuated personnel was transported to Catania, Italy. The drawdown of U.S. forces also seems to include special operations units and intelligence personnel based in covert facilities throughout Libya. CIA-affiliated private airlines such as Tepper Aviation – likely tasked with extracting personnel – conducted several flights to Libya in the past 36 hours. On April 7, a Special Operations Command (SOCOM) Beech B300 King Air was tracked on ADS-B exchange while conducting sorties over Misrata, likely providing ISR for an ongoing evacuation. Misrata airfield is the main covert facility used by the U.S. and allies in Libya and the largest air base of the Tripoli-based Government of National Accords (GNA). The evacuation of U.S. personnel from Misrata has become necessary, as the self-styled Libyan National Army (LNA) under Haftar has recently announced plans to capture the city and establish a no-fly zone over western Libya. After capturing the former Tripoli Airport on Sunday, the LNA is advancing towards Tripoli’s southern outskirts. Tripoli is currently controlled by the U.N.-recognized GNA which encompasses a myriad of militias, including Islamists. Haftar is in close contact with Russia and receives covert military support from Egypt, the Kingdom of Saudi Arabia, and potentially the United Arab Emirates. As the LNA and GNA are preparing for a head-on confrontation over Tripoli and potentially Misrata, both sides are mobilizing their anti-surface and counter-air assets to support operations. Despite their threats of a no-fly zone, Haftar’s forces are unable to conduct air interdiction operations (neither airborne nor ground-based) against advanced adversaries such as the U.S., the U.K., Italy or France. However, the LNA’s air capabilities are slightly superior to the GNA. Haftar’s small aviation is able to conduct tactical air strikes at a higher pace than its Tripoli-foe and has the potential to engage in interceptions. Overall, both sides suffer from a severe lack of trained personnel, spare parts and logistical support, limiting their anti-surface an anti-air assets to low-intensity engagements. The LNA’s air inventory consists of two Mirage F-1, twelve MiG-21MF (NATO reporting name: Fishbed-J), three MiG-23ML (Flogger), and one Su-22 fighter bomber (Fitter). It is believed that the vast majority of the LNA’s aircraft are serviceable due to repair and maintenance support provided by Egypt and the UAE. The LNA also fields several ZPU-2 and ZU-33-2 anti-aircraft artillery and Soviet-made shoulder-mounted man-portable air defense systems (MANPADS). In contrast, the GNA operates two MiG-23ML (Flogger), one MiG-25 (Foxbat), five G-2 Galeb, thirteen L-39ZO Albatros fighter jets, eight Mi-24 and three Mi-35 attack helicopters (Hind and Hind-D). The Czechoslovak-made L-39ZO Albatros light aircraft serve as the GNA’s main attack aircraft, as the fleet has been repaired by Ukrainian specialists and undergone trainer-to-fighter conversion. Despite these limitations, the GNA is still able to neutralized “easy” targets (e.g. vehicle columns and exposed infantry units) of the “Islamic State” and LNA. In terms of anti-air systems, the GNA has one 2K12 Kub (NATO reporting name: SA-6 Gainful), which was recently declared operational and is believed to still house a few S-125 (SA-3) surface-to-air missile (SAM) systems. Anti-surface operations are already underway. Recently, the GNA reportedly struck an LNA convoy near Garyan (90 km south of Tripoli). On April 8, an LNA MiG-21 bombed the runway of Mitiga Airport, near Tripoli. Furthermore, both sides have mobilized their SA-6 SAMs. However, there is no indication to whether those systems are operational. Contrary to rumors, the Russian Navy (RuN) will not establish a military base in the town of Zeila in northern Somaliland. The United Arab Emirates (UAE) will however soon operationalize a air-naval facility in Somaliland, as part of a wider strategy to secure the region’s maritime trade choke points. 1. Rumors about Russia’s plans to establish a military base in the self-declared state of Somaliland have circulated since April 2018. The story was first reported by Somali outlets and then picked up by the British newspapers Sun and Express , pro-Russian outlets such as Southfront, and a number of Twitter users. Recently, the claim featured in Kenya’s major newspaper Daily Nation. The reports state that Moscow will recognize the independence of Somaliland in exchange for permission to build an air-naval base in Zeila/Sayla on the border with Djibouti, which will host 1,500 Russian troops, warships, and submarines. A meeting between the foreign minister of Somaliland and a Russian diplomat is cited as evidence for the deal. 2. The story is almost certainly fake news, copied word-for-word from a Reddit post in the “Global Powers” role-playing thread, which was published 11 months ago. 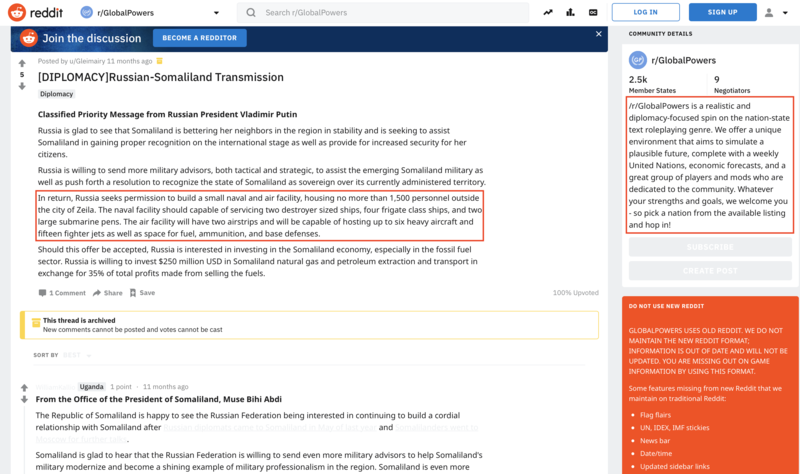 While the reddit post is still available , the Somali news outlets, which first spread the news, have since deleted their claims. 3. IMINT obtained via Sentinel-2 satellite reconfirms that the port of Zeila has not seen construction activity in the past year. If Russia indeed plans to build a naval base in the area, some newly built infrastructure such as naval peers, fences and asphalt layering or evidence of exploratory activity should be observable by now. 4. In the current political and economic climate, Russia is unwilling and unable to build overseas military installations from scratch. As the case of Syria (Tartus and Latakia) shows, Moscow generally prefers to obtain leases for Soviet-build airfields/ports and other existing installations, which already have a baseline infrastructure. As the RuN is undergoing a modernization and downsizing program, it is highly unrealistic that Russia will be able to establish and maintain a 1,500 men overseas presence, including surface and subsurface vessel, as the rumors suggest. 5. While Somaliland hosts a Soviet-built airstrip and harbor in the city of Berbera, the Parliament of Somaliland granted exclusive access to the UAE in May 2016. The 30-year concession authorizes the UAE to establish a 42 square kilometer base in Berbera, consisting of naval facilities and two parallel runways. The air-naval base is intended to support heavy aerial traffic and host various naval assets, including warships, to launch operations against the Iranian-backed Houthi militia in Yemen. The base is expected to become operational in June 2019. 6. As part of its maritime strategy, the UAE has also established military bases in Yemen’s main ports (Aden and Mukalla), Eritrea, and temporarily on Socotra Island. Through the Horn of Africa deployments, Abu Dhabi aims to secure the Bab el-Mandeb Strait, which represents a strategic choke point for oil transports to the European and North American markets. The Iranian-backed Houthis have conducted numerous seaborne attacks against commercial vessels transiting the strait, forcing Saudi Arabia to suspend oil shipments in the area. 7. The UAE’s presence in Somaliland is not limited to military interests. The Emirati company DP World currently holds a 51% stake in the Berbera port and plans to invest $442 million. Abu Dhabi is expected to revamp the local civilian airport and build roads to Ethiopia. Emirati soldiers will train Somaliland’s coastguard to combat piracy and supply Somaliland with coastal surveillance systems, similar to capacity building programs in Somalia’s autonomous region of Puntland. 8. Since Berbera is unavailable as a Somaliland base (and the Zeila deal fake news), Moscow is seeking other options to gain a foothold in the Horn of Africa region. Russia and Sudan are reportedly discussing the establishment of a “naval supply center” on the Red Sea coast. In fall 2018, Russian Foreign Minister Lavrov furthermore announced plans to establish a “logistics center” on Eritrea’s Red Sea coast. While Lavrov did not provide specifics, possible locations include the ports of Massawa and Assab, which offer strategic access to the Bab el-Mandeb Strait. The UAE already operates a air-naval installation in Assab. 9. The establishment of small logistics facilities in the Horn of Africa region could provide critical operational support for Russia’s expanding military and commercial interests in Africa and allow Moscow to compete with its Western adversaries, while keeping the initial investment and footprint low. This approach fits within Russia’s overall Africa strategy, which relies on politically deniable subversive operations spearheaded by irregular assets such as private military corporations (PMCs) and intelligence agencies. 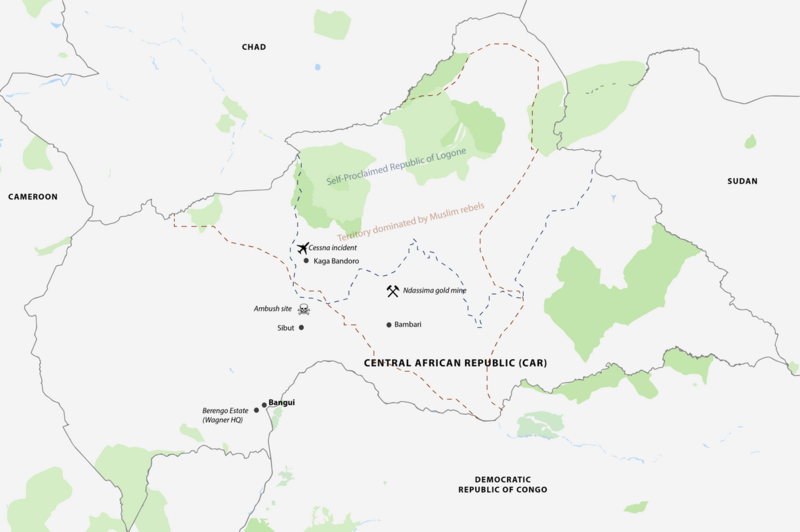 (1) On July 31, 2018, three Russian journalists were reported dead near Sibut, Central African Republic (CAR). Kirill Radchenko, Alexadner Rastorguyev and Orkhan Dzhemal were travelling between Sibut and Kaga Bandoro – the capital of a breakaway proto-state led by Muslim militiamen. (2) The official investigation, conducted by local authorities, the Russian embassy and the U.N. mission to CAR, indicates that the journalists passed the Sibut checkpoint around 2000 GMT. Ignoring advice not to travel at night, they were ambushed by unknown assailants 32 km north of Sibut. According to CAR authorities, ten armed individuals, “wearing turbans and speaking neither French nor Sango” (suggesting Muslim miliamen) attempted to steal their vehicle. When the three journalists resisted, they were shot dead. Their injured driver escaped and informed the police in Sibut. (3) Since armed robberies and assaults on foreigners are common occurrences in war-torn CAR, the official narrative does seem plausible. Possibly, the three journalists were merely at the wrong place at the wrong time. The nature of their research in CAR is, however, raising suspicions of foul play. (4) Radchenko, Rastorguyev and Dzhemal were reportedly working on a documentary film about the Sankt Petersburg based private military corporation (PMC) Wagner and its activities in CAR. The Wagner Group is allegedly owned by Yevgeniy Prigozhin, a magnate closely associated with President Vladimir Putin. (5) While the Russian government has never officially acknowledged the existence of Wagner, the PMC has been the go-to choice of the Russian Military Intelligence (GRU), when it comes to outsourcing politically sensitive external operations. In particular, Wagner is known for fighting alongside regular Russian troops and Iranian-backed militias in Syria and for aiding the separatists in Eastern Ukraine. The death of the three journalists now also exposes Wagner’s involvement in CAR’s security and mining business, throwing light on Russia’s newfound African ambitions. (6) Taking inspiration from the Soviet past, Russia increasingly attempts to access rare resources and crowd-out Western influence in developing countries. In this regard, CAR is of high-priority, as it is the world’s poorest country, highly unstable and violent, but also rich in mineral resources such as gold, (gem-quality) diamonds, and uranium. In 2013, the country descended into chaos, as Muslim militias toppled the government. While a French military intervention pushed the rebels out of the capital in 2014, the central government remains powerless in the provinces. A 6,000 men United Nations (U.N.) peacekeeping mission guards the fragile status quo. (7) In November 2017, Russia received a waiver from the U.N. to sell weapons to the CAR central government. The procurement list includes 900 Makarov pistols, 5200 Kalashnikov assault rifles, 840 Kalashnikov light machine guns, 140 sniper rifles (mostly Dragunov), 270 rocket propelled grenade (RPG) man-portable anti-tank rocket launchers, 20 man-portable anti-air defense systems, and ammunition. In order to train the CAR military, the Russian government deployed 170 civilian advisors (Wagner Group operatives) and five officers of the Russian Armed Forces. (8) According to an investigation by CITEAM, Wagner has established its central command at the Berengo estate 35 km southwest of the capital. 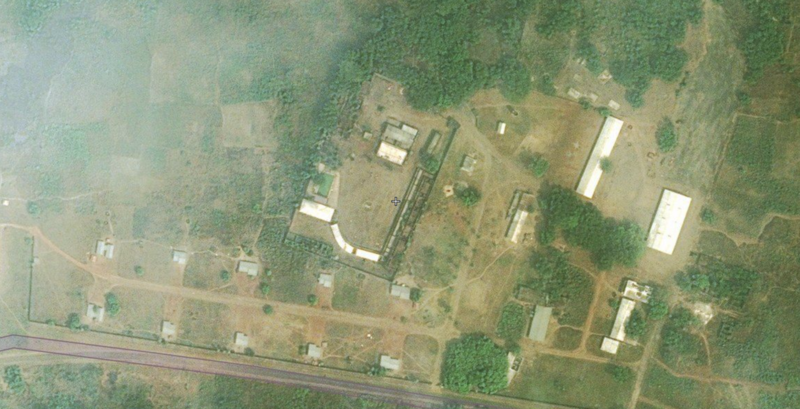 Satellite images collected by CITEAM reveal that a double row of tents was erected in the estates’ courtyard on January 22, 2018. The compound was one of the sites that the three Russian journalists attempted to film – they were denied access, as they lacked proper press accreditation. (9) Besides deploying “civilian advisors” for CAR’s central government, Wagner is also involved in the country’s mining business. Most notably, the PMC provides armed security services, including equipment transport and site security, for the company Lobaye Invest. (10) Lobaye Invest is part of the Saint Petersburg based M-Invest Group, which is closely associated with Wagner’s founder Yevgeniy Prigozhin. In recent month, Lobaye has reportedly assumed operations at Ndassima gold mine 60 km north of Bambari. Officially, the Canadian company AXMIN holds the exploitation rights for Ndassima mine as part of the “Passandro Gold Project.” However, in December 2012, the mine was seized by Muslim rebel forces. After their takeover, the rebels have forced the local population to work in the mine, extracting gold through rudimental techniques. 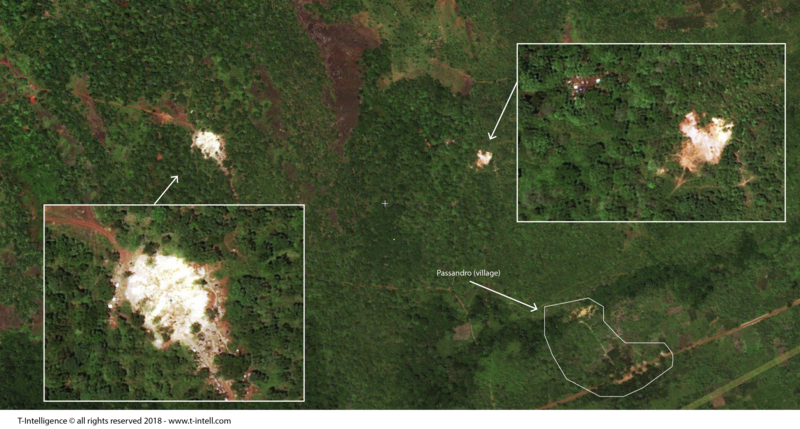 Satellite imagery shows the two largest queries of the Passandro project area. Ndassima gold can be seen on the left. (11) As their lack of know-how does not allow the rebels to operate Ndassima mine at full capacity, is is highly likely that they have struck a deal with Wagner, allowing Lobaye to exploit the mine in exchange for a profit share. According to a report by the Russian newspaper Novaya Gazeta, Wagner representatives toured the area around Ndassima mine in April 2018, negotiating directly with rebel leaders. 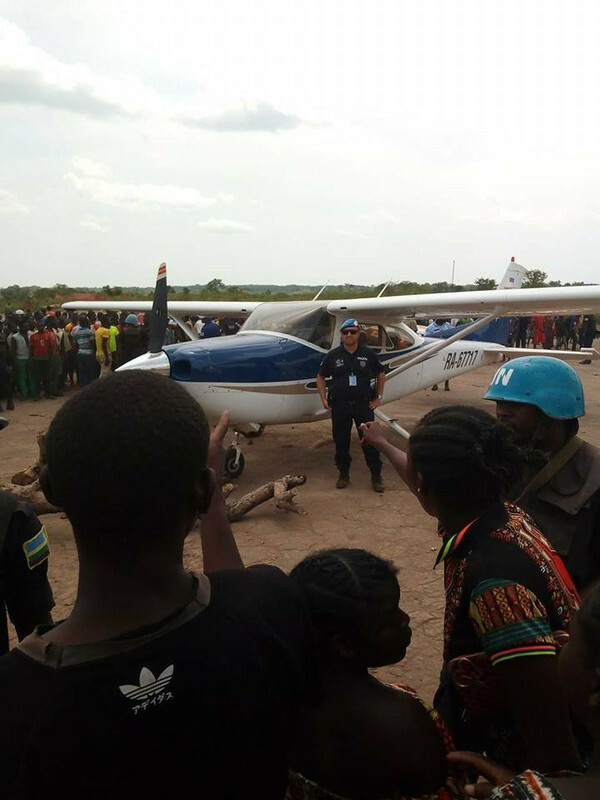 The mercenaries’ activities received public attention, as their Cessna plane was blocked by residents in Kaga-Bandoro. Sources suggest that the three killed journalist were planning to document Wagner’s current presence at Ndassima mine. (12) The Wagner/Lobaye-rebel collusion is a direct infringement of Russia’s security commitments to the U.N-recognized central government. The Russian-CAR security accord mainly seems to serve as a front for advancing the commercial interests of Putin’s oligarchic circle on the mineral market in Africa. At the same time, Russia’s double-edged game will likely exacerbate the government-rebel tensions and further destabilize a region traditionally policed by the U.N. and the French Republic. With Wagner in the forefront, Russia is killing three birds with one stone: selling weapons to the CAR government, exploiting the rebel-held mines, and stirring trouble for the West.